The City of Whittier is fortunate to be served by the fine men and women of the Whittier Police Department. It is our feeling that a safe community is a prosperous community and the residents and businesses in our cities benefit greatly from the professionalism and excellence of the WPD. The Whittier Chamber is proud to host the Annual Silver Shield Awards Banquet and Appreciation Dinner in honor of those who have taken an oath to serve and protect both cities. Please join us at this very special community event on Friday, February 22, 2019. We are pleased to announce that this year's event will be held at the beautiful Pacific Palms Resort. Sponsors and their guests are invited to arrive at 5:30 p.m. for registration, cocktails, networking and more. 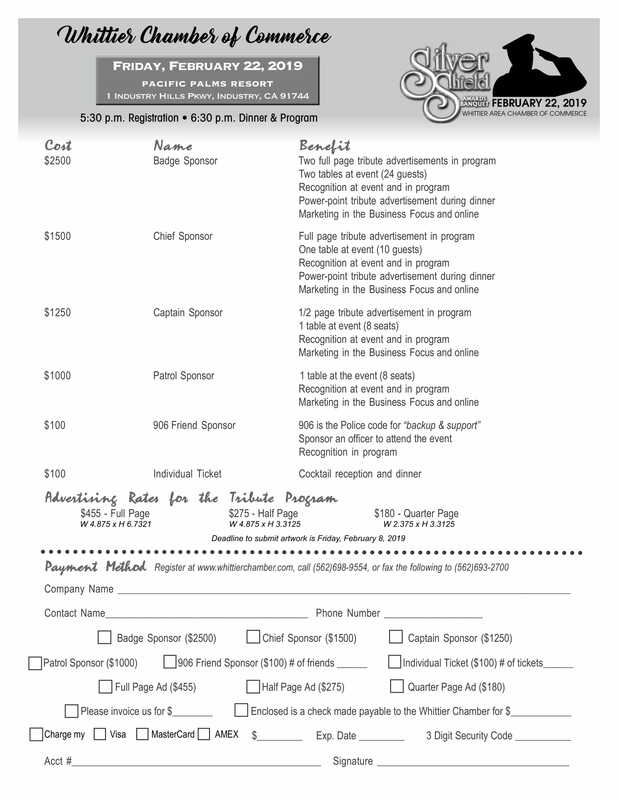 The formal dinner program will begin promptly at 6:30 p.m.
Click the photo below to download a PDF version. Registration & Cocktail Hour - 5:30 p.m. Appreciation Dinner & Awards Banquet - 6:30 p.m.